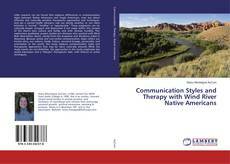 Little research can be found that explores differences in communication styles between Native Americans and Anglo Americans, even less about effective and culturally sensitive therapeutic approaches and techniques. And yet a mental health clinician's role can decide whether or not client behavior is "normal," "healthy," or "appropriate." These judgments can be culturally biased, arrogant and destructive if not made within the context of the client's own culture and family, and with clinician humility. This exploratory qualitative project studies ten clinicians who worked with Wind River Reservation clients, mostly from the Arapahoe and Shoshone tribes in Wyoming. Because verbal and non-verbal communication styles reflect our human story, our culture, family, history, ancestral lineage, personality, and orientation to the world, this study explores communication styles and therapeutic approaches that may be more culturally attuned. While the study results are not definitive, the approaches in this study emphasize less verbal expression and a "Halcyon" therapeutic style, with indirect or active techniques.